To the school, the management, teachers, parents, guests, and fellow graduates, a pleasant morning to you all! I know most, if not all of you, want to get out of here as quick as possible to celebrate the end of your elementary school, but why don’t we appreciate this first. Just look at this, you’ve finished another chapter in your life. 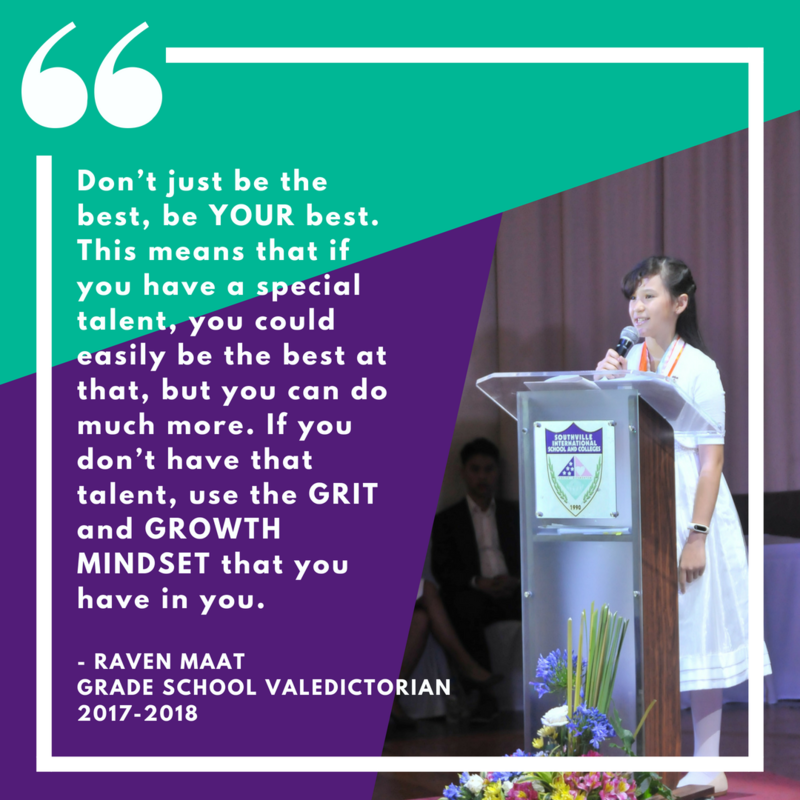 You’ve done it all: done all your term tests, you’ve presented your Portfolio Assessment for Southville Students (PASS), took your exams and you’re here! It’s a time to celebrate. A time to feel good. So, let’s end this academic year right! Today, May 24th, 2018, is a day that most of us won’t forget. Why? Well, just look. All of you have worked so hard, you got your medals and some got special awards. It’s not just the students celebrating though, it’s everyone. Your parents and guardians are here because they’re proud of what you did. They’re proud that you’ve accomplished so much. Our amazing teachers who helped us learn, they’re celebrating because it’s another successful year. They can enjoy the happy faces that come with learning. See? Everyone’s celebrating this wonderful moment. We’ve made so many great memories together. This graduation is not just to show that you’ve passed elementary school, it’s to summarize all our moments. Our joys, our sad moments, our learning experiences. We’ve seen many people leave, but we still go on. Just like people, the memories themselves last a few minutes, if not hours, but when they ‘go away’, they’re still in our minds as we remember them, as well as in our hearts. Today, is a day that most of us will recognize as “finally, the end!” but, there’s still so much more to come, which is fine. We just graduated. We’ve made it through a tough year. We’re ready for anything that comes our way! Next up: High School! We can do this because we have each other to stand by when we need one. So thank you, all of you. I am taking this chance to give my heartfelt thanks to everyone who have made me what I am and who I am today. First and foremost, I would like to thank the Lord, our God, for being with me throughout my whole journey. Answering my prayers and helping me in doing what I need to do. Next, I would like to thank my beloved parents. I feel so thankful and blessed that you’re there for me and that you support me all throughout. Without your help, I would think that getting this award wouldn’t be possible. You made me push harder and try my best. You’re one of the main reasons why I am standing here today. You’ve given me one of the best gifts I have received from anyone: happiness and an amazing education here at Southville, so that’s why I would like to ask my parents to stand up right now so everyone give you a warm round of applause. To my brother, for all his help and for making me believe in myself when I most need it. I would also like to thank every single parent of these graduates, biological or not. You’ve helped all of us come here to be in this graduation today. You have cared for us for all these years and helped us reach our goals. To my first grade teacher, teacher Jorge, who, from the beginning, made me understand who I am and showing me my true potential. To my fourth grade adviser and Math teacher, Sir Mar, for believing on what I can do, and introducing me to the extracurricular activities, making me be more involved. Thank you for making me love Math. I like Math, but Sir Mar made me enjoy it. I always feel happy whenever I learn Math, and you’re the reason why, so thank you so much Sir Mar. To my homeroom adviser, Ms. Zarah, for being with me and my fellow classmates, and giving us a little light in the tough journey through grade 6. To my PASS adviser, Ms. Syra, for helping me with my PASS and making me understand it more. To the school management, for making their students well-rounded, in both academic and extracurricular. To the head of math department, Ms. Juvy, for giving me the opportunity to join all the math contests that are happening. To my Science teacher, Ms. Cristine, for making me step out of my comfort zone, and showing me how to do my best. To my Social Living and Global Education (SLGE) teacher, Sir Jude, for making SLGE more interesting to me. To all the teachers I didn’t mention, I assure you, every single one of you helped me in a way that makes me happy to be your student. I’m sorry for the rough times whenever we are rowdy, but you still help us quiet down and give us room for learning. Thank you for teaching all of us the way and helping us learn. To all my old classmates from star campus, thank you for being with me when I first started to study here in Southville. Thank you for not teasing me because I was the new student, instead, you all made me feel welcome, so, thank you. To my friend, Sisi for getting me into the play, Annie, when I didn’t join the audition before that, and getting me to like basketball much more than I used to in Grade 5. To my friend, Arin Lee, though she may be in Malaysia, she is still an amazing friend and one of the friends I had since grade 1. Arin, you may be far away, but you’re always near my heart. To my friend, Ashley Choi, though she is a year above me, and is in Korea, she is one of the best friends I had, and I was sad to see her leave. Ashley, thank you for being with me and making me have a great time whenever I’m with you. To my friend, Lorelai, who, since my arrival in Star campus, was a friend I could be with, someone I could trust. Lorelai, you’ve been my friend for so long. You’ve been with me through thick and thin. You’re really someone I can feel a strong connection too. I feel happy when I’m with you. You’re leaving after grade 6. We’ve been through a lot together, I just wanted to let you know, you’re still one of my best friends and even when you leave, I will still remember you, and all the great memories we had together. You know, why don’t we ask everyone to say goodbye to their friends who are leaving Southville next year. Let’s all give these people a proper goodbye before they leave. To all of my friends, already mentioned or not, Sisi, Lauren, Rianna Ang, Reana Manalo, Mika, Lorelai, Isabela, Arin, Tiffany, Ashley Atilon, Ashley Choi, and all the other people who I haven’t named, thank you for sticking with me when I most need it. Thank you for understanding me, and believing in me even when I don’t. You all made my grade 6 memorable and amazingly awesome. Now, it’s not just my relatives, the teachers and my BFFs who I’m thankful for, I would also like to give a sincere gratitude to one of my classmates, Ryza Takahashi, for letting me join in the dances once I got interested. Dancing is a part of me that I wouldn’t want to take away, and I believe one of the first times I felt good doing it was when you let me join your dances. Lastly, I would like to thank my rivals, Matthew Cabiles, and other people who wished not to be mentioned. Without them, this grade 6 journey wouldn’t be that interesting. Thank you for making it fun and exciting, and for making me try my best, pushing me to keep going. Now I just wanted to say, this is a great privilege to stand here, talking in front of the 25th batch of graduates in Southville as the 1st Honor. I feel greatly fortunate that you are my batchmates because all of you are amazing. You all are unique, you succeed in different ways. We are all here today because of the milestone that is graduating. Although, some people found it easy, some found it hard. Some have tutors, some just study by themselves. No matter how you did it, we are all the same. I’d like to share my experience with you, so that maybe one day, you could use it. First of all, talent doesn’t mean success. Yeah sure, talent can get you a good start in that particular skill, but with no hard work, your talent can be more and more reachable to people who don’t have that talent as you get older. Do you know the tale: The Hare and the Tortoise? One of the fables written by Aesop. Where a hare was over-confident, and underestimated the tortoise and that’s how he lost a race. Yeah, don’t be that hare. Talent is a gift, cherish it. Also another reference, “With great power, comes great responsibility.” It’s like saying, “With great talent, comes great responsibility”. If you have a great talent, practice it, make it better so that you can succeed more. There is another thing that I learned throughout my elementary years: “Don’t just be the best, be YOUR best”. This means that if you have a special talent, you could easily be the best at that, but you can do much more. If you don’t have that talent, use the GRIT and growth mindset that you have in you. Yes, there are people out there with special talents, but you can be better than them, as I said earlier, some people don’t always do their best when they’re talented, they often overestimate their abilities and think that they “Don’t need to ‘upgrade’ it”. So just try your best and you may even surpass the talented ones. Then, you will have a talent that they won’t. It’s called DETERMINATION. Now, if you follow my advice, you might not have the talent, but you will have the dedication, and a goal. Next, you need to achieve it. If it’s about something that takes many tries, or something that just takes a while to complete, you’ll always find something that blocks your way. You need patience, this goal is something you want to achieve, so you can’t just give up after it didn’t work the first time. It usually never does, so don’t feel bad that you got it wrong or something happened that you didn’t want to, be happy that you were able to gain new information about your goal. Be patient, keep trying, keep finding new ways on how to achieve it, try a different perspective, and keep going. It may be hard to achieve, but that’s what makes it a goal, we all have multiple talents, you may not know it yet, but you do, and one of those is that you CAN make a difference. Thank you, and have a marvelous morning!